Lenovo made good decision in S820 by combining MTK 6589W 1.2 GHz Quad Core processor with PowerVR SGX544 in graphics processing unit, these two combination returning best budget Android smartphone that compatible with most of Android application and games in Play Store. MIUI is the first Custom ROM on Internet, that available for Dual-SIM MTK Device. You have to know that there are two types of Lenovo S820 series, which is S820 and S820e. The international version should be S820, while S820e is exclusive bundled version from China Telecom. There are two ROM marking for Lenovo S820, which is International (Lenovo S820_ROW) and China marking. The one I bought in Malaysia (might be in other country as well) is Lenovo S820_ROW. Marking is considered as partition table. China (CN) marking and International (ROW) marking has different partition table (layout) but both are convertible. Means, we can convert ROW marking to CN marking and so on. MIUI ROM based on my experience, only works in CN marking, so you need to convert to CN marking if your S820 now is on ROW marking. NOTICE: THERE ARE NEW LENOVO S820 VERSION WHICH HAS NEW PARTITION LAYOUT (8GB). PLEASE DO ANOTHER RESEARCH ON HOW TO INSTALL CUSTOM ROM IN THIS PARTICULAR TYPE. PLEASE DO NOT CONTINUE THE PROCESS IF YOU OWN THIS KIND OF DEVICE. Please be familiar with SP Flash Tool (including install MediaTek USB VCOM drivers). You can read complete tutorial in this forum. The one that I notice is important in this process is: You must enabled DA DL All With Check Sum option in every flashing process. To install MIUI ZIP package, you will need CWM Custom Recovery (CWM_v6.0.3.4_S820_CN.7z) that you can download here. 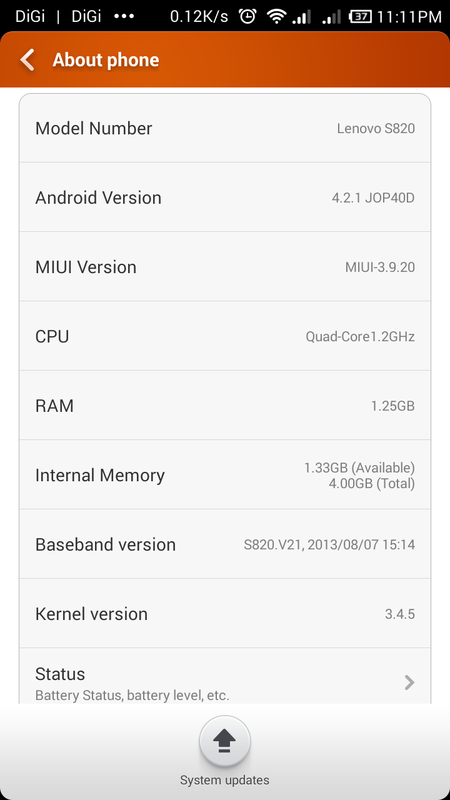 MIUI ROM (even the latest version) shipped with old version of radio firmware (V.12). You may need to update this firmware by using new radio firmware (S820.V21_modem.zip) from S820_ROW (V.21) that you can download here. This package is CWM Recovery ZIP install package. I don't use GApps package that came with MIUI ROM because I'm not able to use Network Location service in all application that required Network Location such as Foursquare, Google Maps, etc. Although GPS still works but It took longer to lock GPS signal. 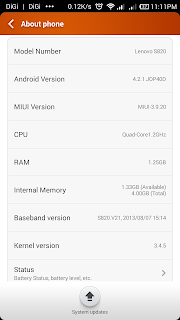 This is happened because by default MIUI use Baidu location service. 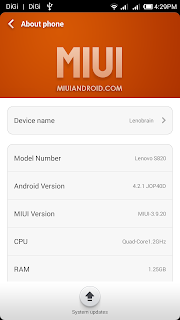 In order to fix this problem, I use the GApps package from here (gapps-jb-20121212-signed.zip) because the full package will install all Google Service layer to use with MIUI ROM. Do full firmware upgrade by flashing S820_S137_130711.rar. This process will directly convert your Lenovo S820 ROW marking to China marking. Warning: This process will wipe all data in your phone! Do backup first! After flashing finish, don't turn on your phone yet (it's OK if you did, just turn it off again) and unplug USB cable for next flashing process. Flash CWM_v6.0.3.4_S820_CN.7z (CWM Recovery) using SP Flash Tool. Please notice that this is CWM recovery that works with China marking. Because we convert ROW to CN marking in first step, that's why we use this version. Turn on your phone by holding Volume Up + Volume Down + Power button until Lenovo boot logo appears. In CWM Recovery advanced menu, mount the USB Storage and copy all required CWM installation package (miuiandroid_lang_S820-3.9.20.zip, S820.V21_modem.zip, gapps-jb-20121212-signed.zip) to the root folder of you external SD Card (you can use internal if you want) and after finish, Safe Unmount your USB Storage. You can start to flash miuiandroid_lang_S820-3.9.20.zip and S820.V21_modem.zip first, do factory reset and boot your phone and complete MIUI setup and turn your phone back off for GApps installation. You must complete MIUI setup first before installing GApps package. Because this package is not the one that came from MIUI. To install GApps, enter recovery menu (Step No. 4) and flash gapps-jb-20121212-signed.zip package, wipe cache and boot your phone. You will need to do another setup for Google Account. You may experience forced closed on Settings app during Google Account setup, but don't worry, It's normal. Feel free to contact me if you have any question ... Happy flashing! Reverting back to Stock ROM is very easy! Download Stock Lenovo S820 ROW firmware here, then flash (firmware upgrade) using SP Flash Tool (tool are included on archive). 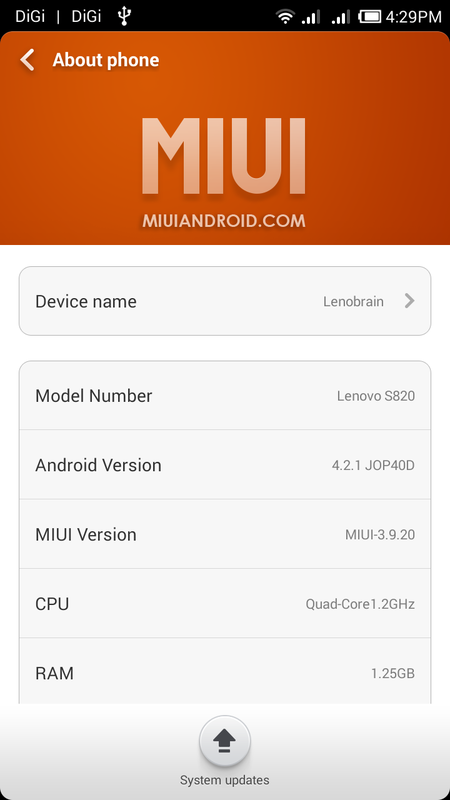 Always check latest MIUI ROM for Lenovo S820 here.